As a casual reggae and ska listener, I can’t say I knew too much about Mr. Desmond Dekker beyond his name and his hit “Israelites” and “007 (Shanty Town)“. I’ve been recently in the mood for catchy upbeat classic reggae though and This Is Desmond Dekkar (despite curiously misspelling his name) is a great introduction to his early work and totally fits the bill. 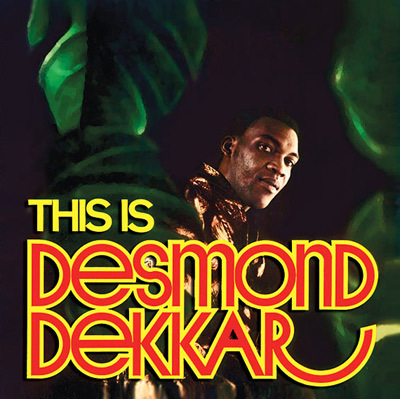 A reissue of a 1969 album, This Is Desmond Dekkar also features 19 additional tracks. The entire album is a stylish, pleasant, transporting experience from the excellent aforementioned hits to the lesser known tracks like Sabotage and Nincompoop. Known as “The King of Ska”, Dekker was at the forefront of a new movement (and even helped Bob Marley with his start). The early 60’s, rude boy portion of his decades long career is well represented here. Plus, there’s nothing better for dancing a baby around than this.